This past week the weather was beautiful, lots and lots of sunshine! Gary and I spent as much time as possible working on the garden. I love this time of year, and so enjoy getting back out into my garden! The Azaleas are blooming! 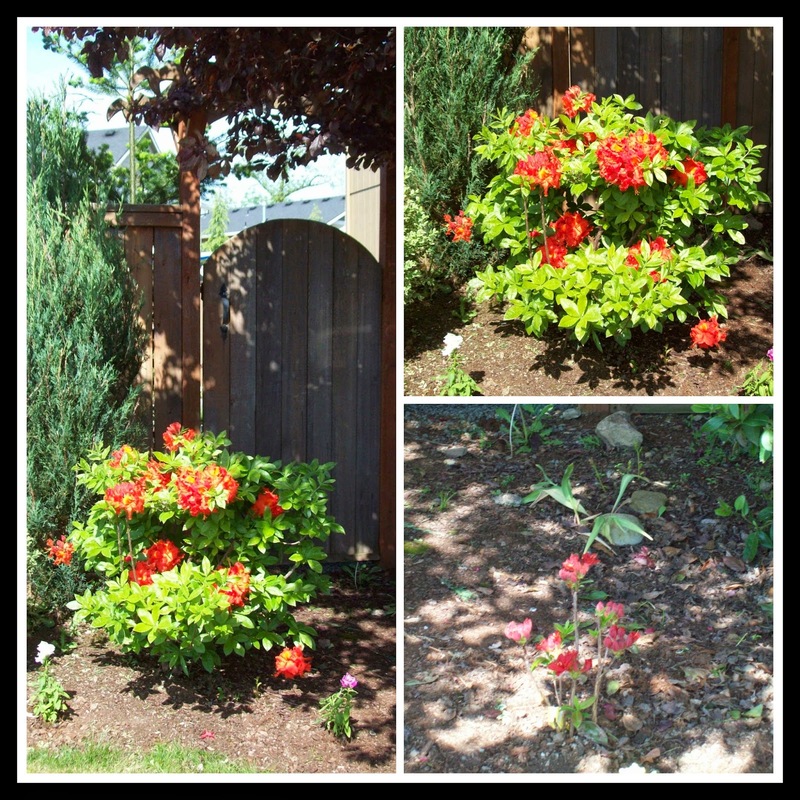 This variety of azalea is my favorite, and I look forward to its bloom every year, this year I found another one on sale at the garden center and decided to bring home a companion for my current azalea, it is quite tiny right now, but covered in blooms, I look forward to watching it grow. We pruned the hedges in the front garden, did a fair amount of weeding, and along with the new azalea we planted a nice bunch of petunias and snap dragons. My veggie garden got a good amount of much needed weeding done, I also amended the garden beds with steer manure to refresh them a bit before planting. I planted a bunch of different varieties of peppers, bell peppers in different colors, jalapenos, Anaheim chili, and one fun sounding pepper- a gypsy pepper, which I am excited to try! The rest of the beds are all cleared out and ready to go when the weather gets a bit warmer, one bed has a row of self seeded bachelor buttons that will look nice blooming along the squash later in the season. 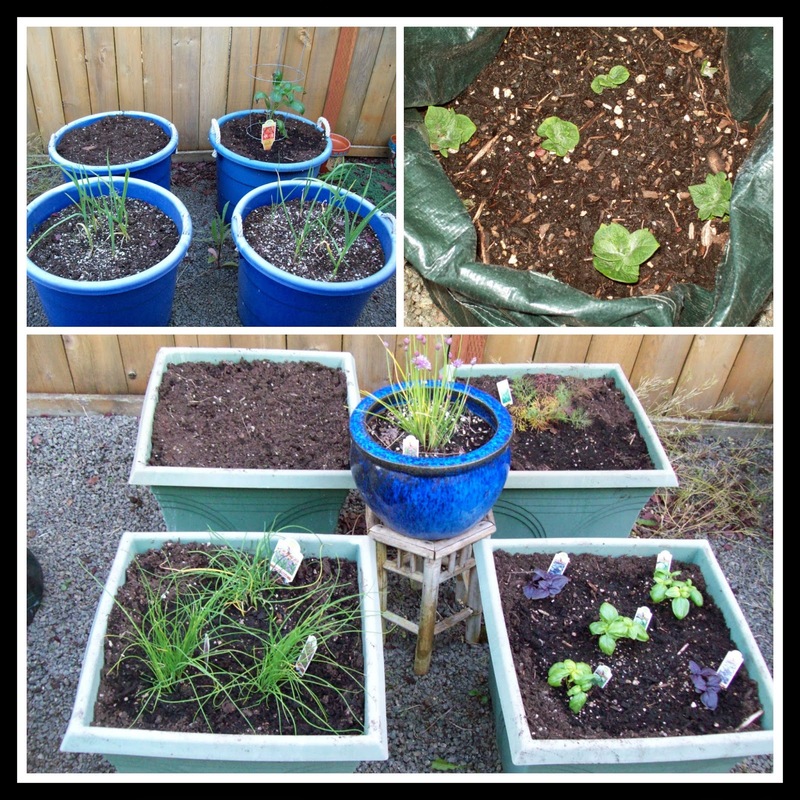 I refreshed the soil in some of my containers as well, the extra garlic I tucked in a few of the pots are doing good, the potato bags are growing nicely, I also planted some basil, extra chives because we all enjoy them on potatoes, and a dill plant. One of the garlic beds is doing really well, the elephant garlic is huge, I am really looking forward to tasting it! The leeks that I planted last year are getting closer and closer to the right size, my they take a while to grow! I am looking forward to harvesting them when they are ready! My other garlic bed did not fair as well, I'm not sure why since the same size bed with the same soil right next to it did fine, but that's okay, a few are still growing, and in the empty spots I planted two varieties of kale and a few kohlrabi plants, hopefully the garlic will help keep the cabbage moths away! 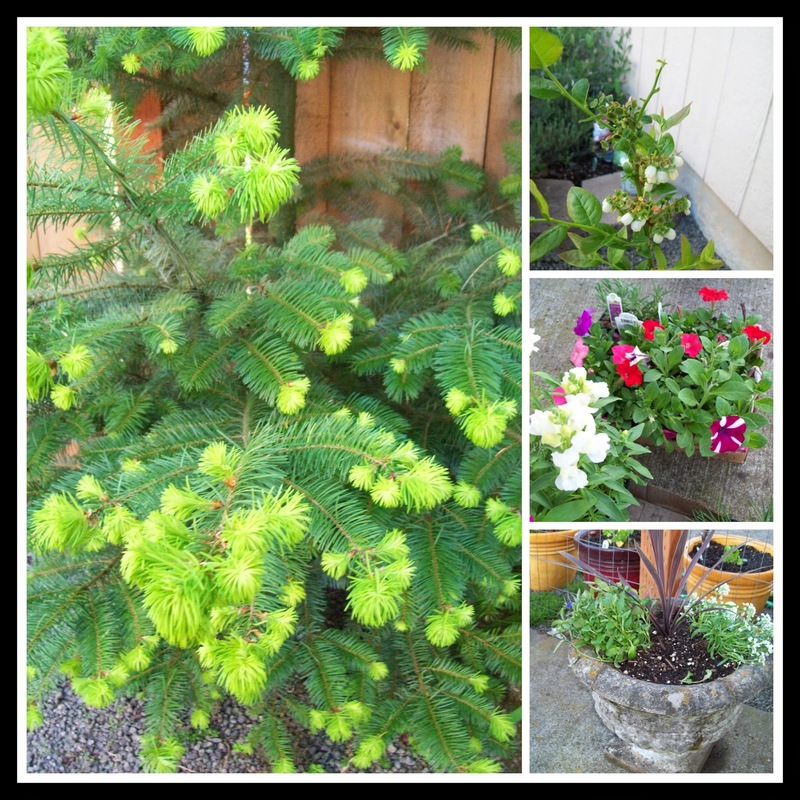 Our little pine tree has the most beautiful color of green new growth on the tips of its branches, the blueberry bushes are covered in blossoms and little berries, and Sarah and I planted a couple of stone planters with some pretty flowers! The garden is looking pretty, we still have a fair amount of weeding to do in some of the garden beds as well as a bit more pruning. Sadly my beautiful rose bush, which was already in full bloom last year at this time is not doing so well, I pruned it way back in hopes it will send out some new vines but in the case that it doesn't I planted a pink peace rose next to it, because I really look forward to roses in the garden, in the meantime I will have to stop by the Portland rose garden to see some pretty rose blooms! I am looking forward to another summer of gardening! 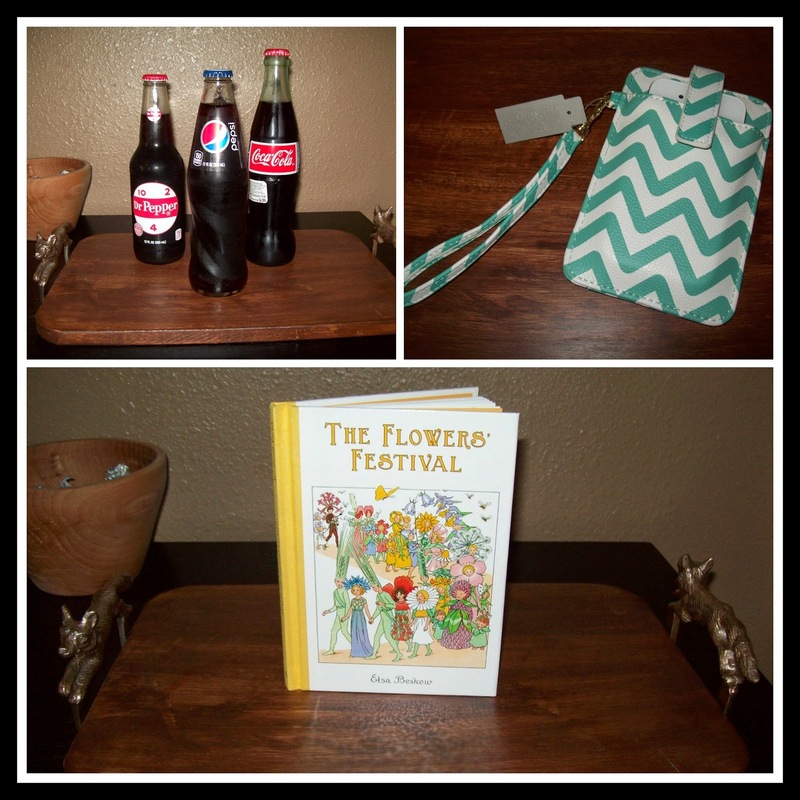 Onto some of my other fun spring favorites- my new Chevron phone case, now my phone doesn't have to float around my giant purse, I just love it! I don't know what it is about the chevron pattern but it is cute. :) I also added a new Elsa Beskow book to my collection- The Flowers' Festival - the illustrations are wonderful, which is why I love Elsa Beskow books, her illustrating is beautiful. I thought this book would be great for gardening season- it is about a Midsummer party, a little girl is not allowed to attend the grown up party, but is instructed by her grandma to celebrate with the flowers- then of course the flowers come alive and tell all sorts of interesting stories- most of the story is cute, but there are some odd parts that a modern parent would probably want to edit out when telling the story to a child like a naughty weed child being drug off for a "thrashing" by old Mrs. Nettle-Yikes! The book was written originally in 1914 so there are some odd bits like that, but otherwise the story and illustrations are well worth it, I love vintage children's literature! We also celebrated Star Wars Day yesterday- "May the 4th" be with you! 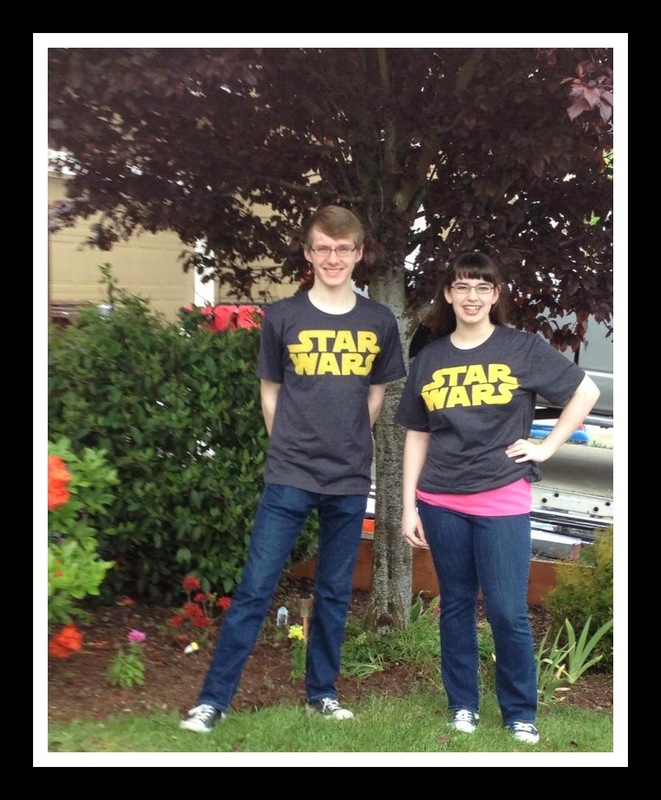 I found the kids matching Star Wars shirts which they enjoyed, they had a great time celebrating with their youth group and had a Star Wars marathon at their youth leader's house. We have awesome youth group leaders, and I am so happy my kids get to hang out with such a great group of people! So that's my spring garden update and ramblings, how is your spring going? What have you got going on in the garden? I have to admit I am entirely jealous. I don't often covet other people's possessions, but I DO covet their extended gardening season! I have purchased my seed potatoes, but alas, that is the extent of my gardening plans so far. It is still too cold here for me to get out there and plant anything at all. Yesterday, we started raking and pruning but nothing new has gone in. We appear to be delayed by about 3 - 4 weeks here. In the meantime, I will admire everyone else's gardening efforts. Thanks so much for sharing your pictures. Gee whiz! I missed Star Wars day! Your garden looks great, April. 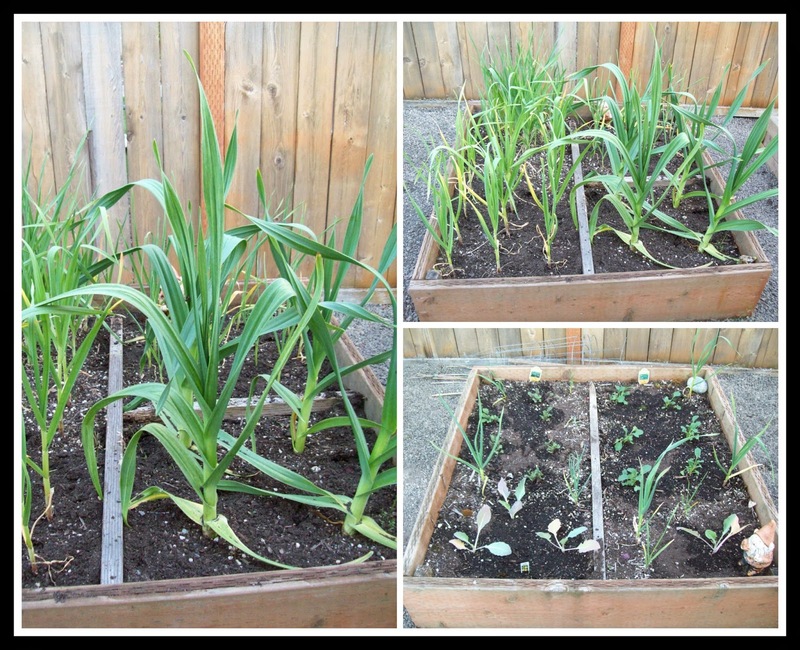 Still too cold here for much gardening, but we did plant onions and lettuce seed. And the asparagus is starting to poke out of the ground.I'm old enough to remember when you could get glass bottles of Coke out of the vending machine. One of my fondest memories was going to the laundry mat with my parents and my dad getting me a bottle of the machine. We didn't get pop very often back then! Ha! Hope your garden is abundant this year! Hello Jane and Natalie! I do consider myself lucky for the mild climate here in the Oregon Valley, we have been enjoying lots of sunshine, but it is always a gamble as we also have out of nowhere late frosts from time to time. But it is hard to resist getting out to the garden when the weather is so nice, so I usually take the risk. :) Glass bottles out of vending machines sound like fun, when I was a kid vending machines were all cans, but we still had those nice tall glass bottles for sale at the corner market, which is where I found myself quite often as a child. Jane you asparagus patch sounds wonderful, I have wanted to put one in for years, and it is still on my list of garden goals, maybe this year? :) I love asparagus! 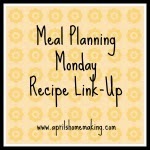 Hope you both have a great week! 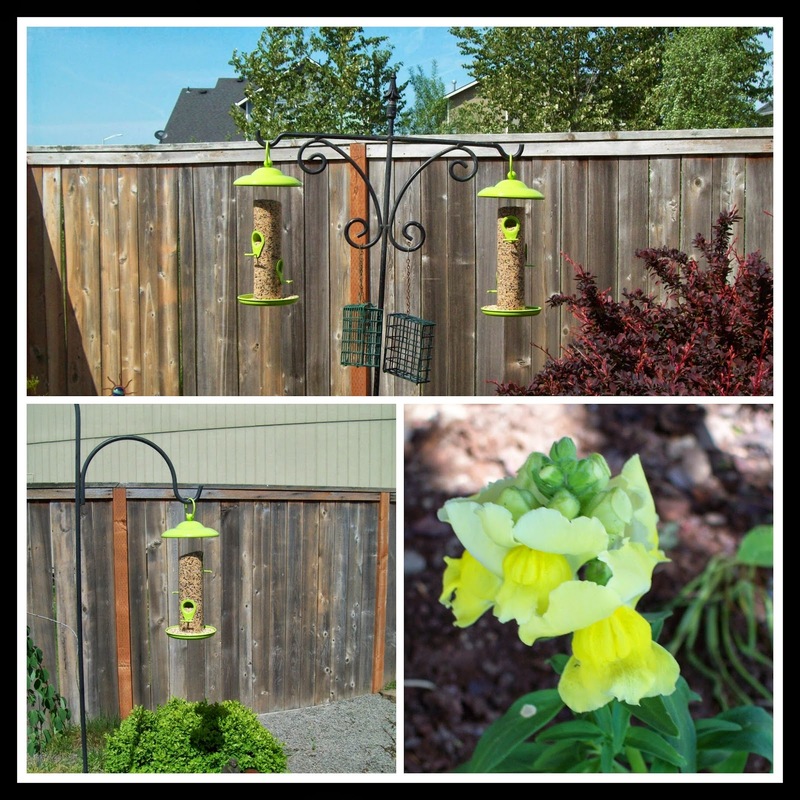 Your garden beds look great! The gate to your garden is very pretty! We homeschool too. Thanks so much for stopping by!! WOW! You have quite a garden there!! Beautiful!! My oldest son is a HUGE Star Wars fan and even stayed over night on the floor in the mall in front of a movie theater for the release of one of the movies!! Your gardens are lovely. I love the variety of items you have growing. 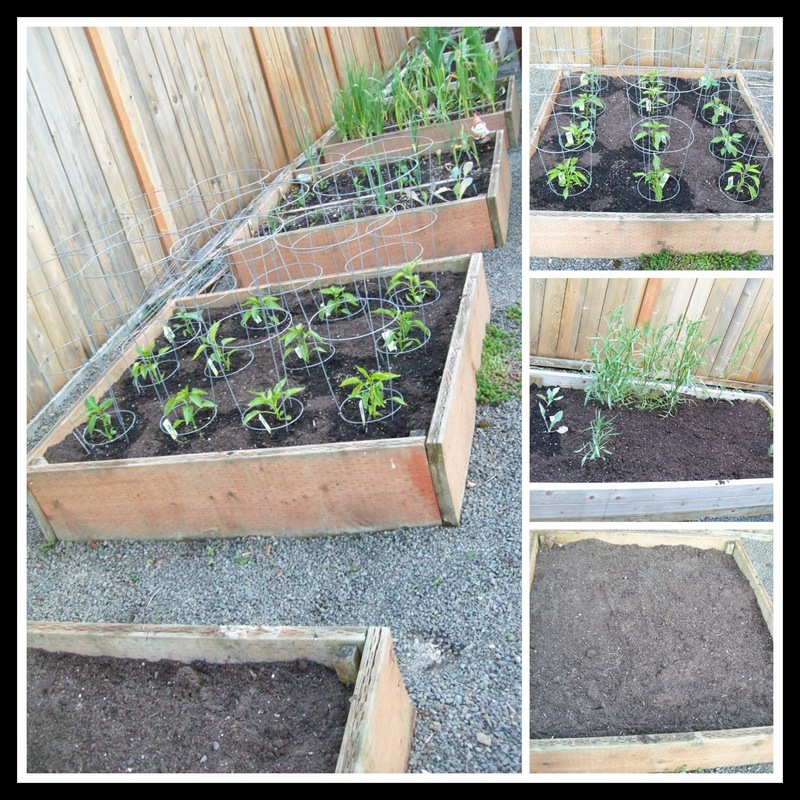 We don't have much space in our yard, but we are growing tomatoes and peppers in containers this year.